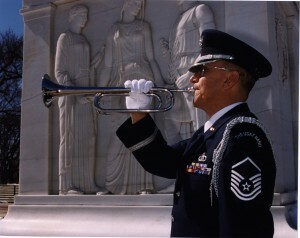 How Did Taps Became Associated With Funerals? How did the call become associated with funerals? The earliest official reference to the mandatory use of Taps at military funeral ceremonies is found in the U.S. Army Infantry Drill Regulations for 1891, although it had doubtless been used unofficially long before that time, under its former designation Extinguish Lights. 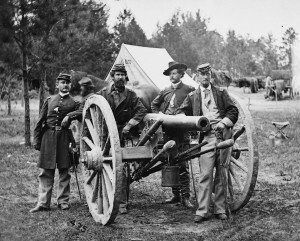 During the Peninsular Campaign, Captain John C. Tidball of Battery A, Second Artillery, lost a cannoneer who was killed in action. This soldier then needed to be buried at a time when the battery occupied an advanced position, concealed in the woods. 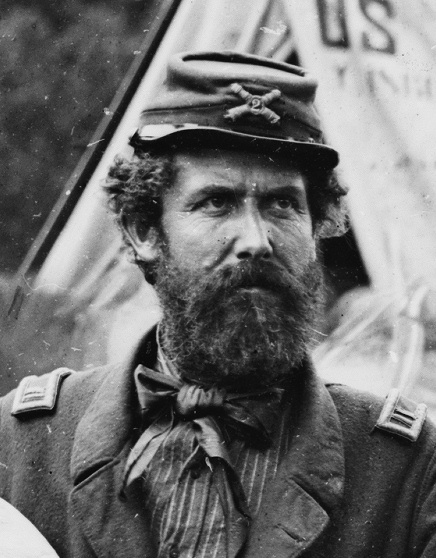 Since the enemy was close, Tidball realized that it was unsafe to fire the customary volleys over the grave. He worried that the volleys would renew fighting. It occurred to Captain Tidball that the sounding of Taps would be the most appropriate ceremony to use as a substitute. He ordered it to be sounded during the burial. The practice, thus originated, was taken up throughout the Army of the Potomac, and finally confirmed by orders (Colonel James A. Moss’s Officer’s Manual, published by George Banta Publishing Co., Menasha, Wisconsin, 1913). Moss also writes that the sounding of Taps may have been inaugurated at West Point about 1840, and it may also have been sounded by certain regiments during the Mexican War. He could be referring to the use of the 1835 or Scott’s Tattoo call. 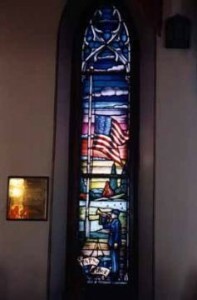 The first sounding of Taps at a military funeral is commemorated in a stained glass window at The Chapel of the Centurion (The Old Post Chapel) at Fort Monroe, Virginia. 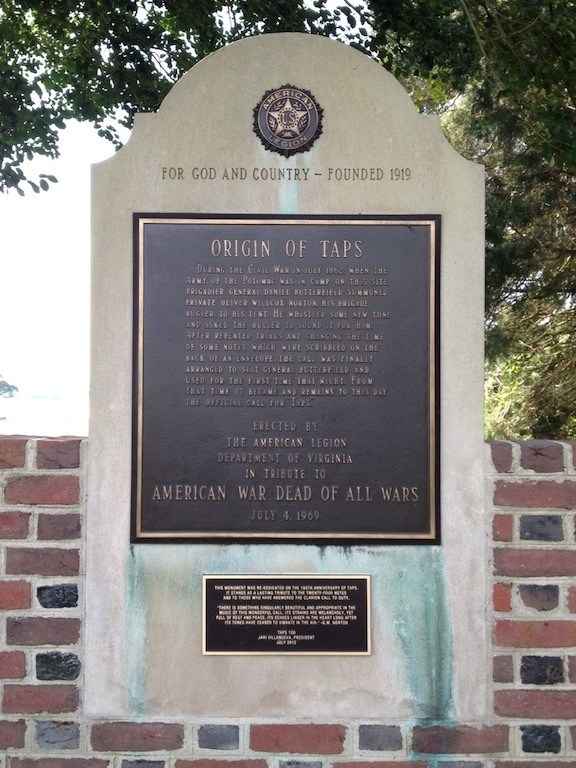 The site where Taps was born is also commemorated by a monument located on the grounds of Berkeley Plantation, Virginia. This monument to Taps was erected by the Virginia American Legion and dedicated on July 4, 1969. The site is also rich in history, for the Harrisons of Berkeley Plantation included Benjamin Harrison and William Henry Harrison, both presidents of the United States as well as Benjamin Harrison (father and great grandfather of future presidents), a signer of the Declaration of Independence. An article (here in pdf format) entitled Prelude to Bugle Call Taps by COL Eugene C. Jacobs, USA (December 1984 issue of a periodical called “The New Age) recounts the birth of the call and the first use of the call at a funeral from Mabel Tidball, daughter of Captain John Tidball and the dedication of the stained glass window at The Chapel of the Centurion. Other stories of the origin of Taps exist. A popular, yet false, one is that of a Northern boy who was killed fighting for the south. His father, Robert Ellicombe, a Captain in the Union Army, came upon his son’s body on the battlefield and found the notes to Taps in a pocket of the dead boy’s Confederate uniform. He had the notes sounded at the boy’s funeral. There is no evidence to back up the story or the existence of a Captain Ellicombe. For more information about Taps, order the booklet Twenty-Four Notes That Tap Deep Emotions: The history of America’s most famous bugle call, by Jari Villanueva. 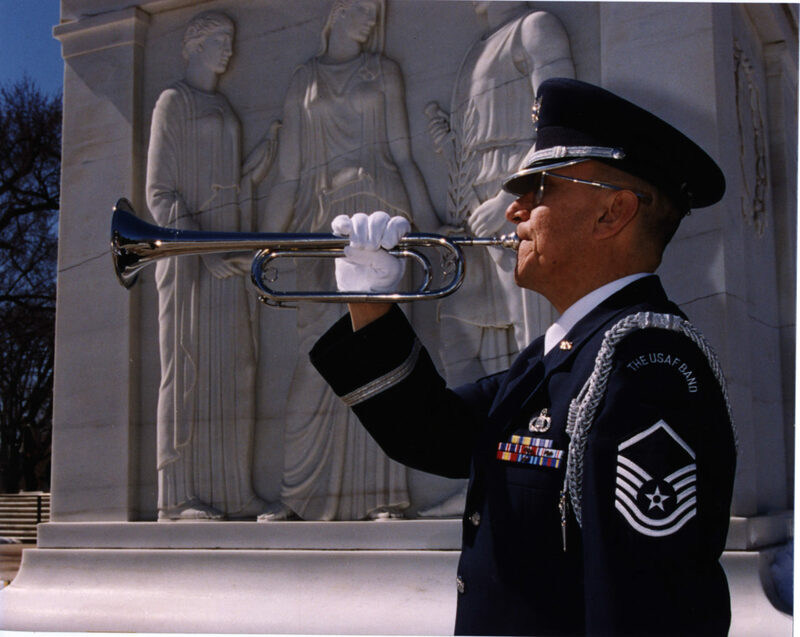 This entry was posted on Thursday, January 11th, 2018 at 8:00 pm	and is filed under Bugle Stories, Buglers Through History, History of Taps, History of the Bugle. You can follow any responses to this entry through the RSS 2.0 feed. You can leave a response, or trackback from your own site. We so enjoy the articles that you send out. We have a yearly flag retirement ceremony at the place we live at in the winter. Husband is in charge of it. We use taps and I especially found this article interesting. Perhaps can use some of the info in our retirement ceremony. Thanks again. Jari: Thank You for these wonderful articles. I, myself am a USCG Vet and I have been playing Taps at The Washington Crossing National Cemetery for5 years. Enjoyed all of this so very much! I have heard it played in it’s entirety several times, by different musicians. Always get chill bumps! Indeed it is lovely, but also so sad. Thank you for all of this information!